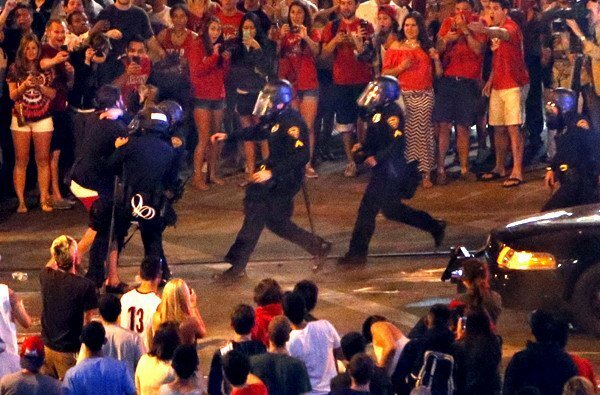 Tucson police shot pepper spray at several hundred fans who took to the streets and threw beer bottles and firecrackers at officers after Arizona’s overtime loss to Wisconsin in the NCAA tournament on Saturday night. There were no reports of injuries to fans or officers, but 15 people were arrested for offenses such as resisting arrest, disorderly conduct and unlawful assembly, Tucson police Sgt. Pete Dugan said. Of those arrested, 14 were released, and one was sent to Pima County jail. Pete Dugan said those advancing on officers were arrested. The street was clear and the crowd was gone by late Saturday. He said crowds leaving bars and restaurants near campus after the game filled University Boulevard and wouldn’t leave despite urging through a PA system and social media declaring it an unlawful assembly. Officers fired pepper spray, pepper canisters and pepper balls, which disperse into the air when they hit, Pete Dugan said. No tear gas was used despite some reports.